Point the cursor over the variety name to see the pronunciation. Types of wines: Runs the gamut from lightweight to full-flavored, dry to sweet, low to high alcohol. It is sometimes made as a sparkling wine. Origin: A member of an ancient, highly esteemed Greek family of grapes vinified in a myriad of styles throughout Italy. Malvasia Bianca is one of the most widely planted, light-colored grape varieties in Italy and the world. On the islands of Sardinia and Sicily, it makes rare, rich and wonderfully aromatic passito wines. 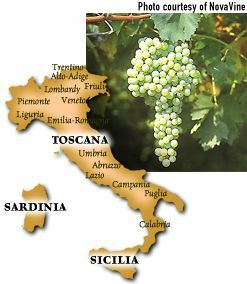 Similar Malvasia dessert wines, made by drying the grapes before crushing, are found throughout central and southern Italy. Malvasia Bianca also is prominent as a blender with Trebbiano in light, dry wines such as FRASCATI, MALVASIA ISTRIANA of Friuli, and the legendary VIN SANTO of Tuscany, which can be quite dry or very sweet. Description: Whether sweet or dry, Malvasia Bianca offers delightful aromas and flavors of honey and ripe Bosc pears with hints of allspice. Round, lushly fruity flavors and a plush texture lead to a finish that is determined by the degree of residual sugar and the cellar treatment. The lightest versions offer a clean, crisp finish, while those aged in small barrels may display light tannins and a hint of vanilla. Sweeter, more opulent versions linger on the palate. Aging: None on the lighter renditions; two years for the full-bodied dry ones. Sock some of the sweeties away for retirement. Best location: Malvasia Bianca can be grown anywhere, but the drier wines profit from cool, sun-drenched hillsides with light, well-drained soils. FastFoodFacts: Seafood antipasto dishes (shrimp, scallops and calamari dressed with oil and lemon) and grilled vegetables for the lighter wines. Grilled fish with light provencal-style sauces for the fuller wines. The dessert wines need only a simple almond biscotti (no chocolate!) to dip in the wine, real Sicilian cannoli or an apricot or plum tarte with a marzipan pastry crust.